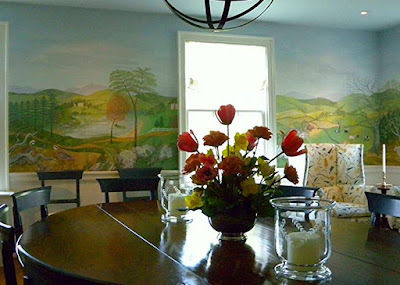 The View from Squirrel Ridge: A Dining Room Mural. I've seen a few of these scenic murals in older homes. People ordered them in sections from Europe and fit the panels together. There were ways to customize them so that your walls were not exactly like your neighbor's. For more murals, visit Monday Murals. That's interesting Linda, I had no idea these types of scenic murals came in panels. Thanks for contributing Linda. A lovely way to have a scenic view, especially if the outlook from your windows was not so bucolic. But then I imagine folks that could afford to have these shipped from Europe had lush landscapes around them! Uma parede muito bem decorada. ...they were popular in the day. What a lovey scene to enjoy while having dinner of many courses and chatting with other important (of course) people. Gorgeous! Never knew that they came in panels and always thought that they were painted directly on the walls. Cool. Very pretty! I didn't know they came in panels either. It is a pretty scene--pleasant to look at while dining. i have seen these, they are so beautiful!! some people are talented enough to paint these in their homes right on the walls!! Hello, pretty mural and scene! Have a happy day! So lovely, glad you shared this.